The Minister of the Federal Capital Territory, Malam Muhammad Musa Bello, has reassured residents of the the FCT that the recent fire incident experienced around the Mpape area of the FCT is not be a major cause for worry. 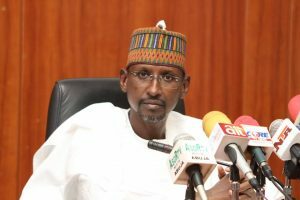 Bello who gave this reassurance when he paid a visit to the area in Abuja on Tuesday, October 2, 2018, in company of the Minister of State, Mines and Steel Development Abubakar Bawa Bwari, following reports of ground vibration and fire outbreak from the earth around the area, said experts have been invited to have a look and determine what actually caused the incident. According to the FCT Minister, “When this matter came up, the chairman (Bwari Area Council) briefed us as to what I’ve seen. But as you can see, we now have experts from the ministry (of Mines and Steel Development). So this means they have seen what oozed out and based on their preliminary observation, this obviously as you can see is not something that should make residents to be very concerned now, because they have taken samples. They have one or two reasons they think might have caused this, but all these cannot be determined until after thorough investigation, he said. The Minister expressed confidence that the relevant experts from the ministry will look at the issue properly and also interact with other agencies to determine the facts on ground. He said government will make sure that the lives and properties of the residents are not at risk at all. Malam Bello disclosed that security agencies have been instructed to cordon off the area so that samples will not be tampered with, adding that officials of the Ministry of Steel Development are working to ascertain the safety of the People and their properties. He commended the Chairman of Bwari Area Council, the community leaders and residents around the area for alerting the proper authorities in respect to what they have observed. Minister of state for Mines and Steel development, Alh Abubakar Bawa Bwari, while corroborating the Minister’s earlier remarks, said samples have been taken by his Ministry and would be analyzed to know exactly the true situation. He said government is concerned about what is happening in the Mpape area and advised residents around the community not to panic. “We are on top of this matter, and will not ignore any slightest information we hear about any occurrence in our environment”, he said. The Director General of the Nigerian Geological Survey Agency, Alex Ndubuisi Nwegbu, who was also present during the visit, however indicated that a malfunction in the electrical installation around the area may have caused the fire incident. According to Nwegbu, “What we are suspecting is that the fusion coincides with the position of the pole, so we are suspecting that perhaps the electric pole must have experienced short circuiting where the heat melts the synthetic material which could be asphalt or something else. Until we subject it to an analytical test, then we can conclusively tell you what material this is made of. So we are going to bore down to know the extent to which this material is buried down and from there we will draw our own judgment.